Google Inc. has added additional security features to its Data Loss Prevention (DLP) service for Gmail, the company announced this week, making it a bit harder for users to send out sensitive information (whether they meant to or not). The new features, which enhance to the DLP function that was launched last year to help business users protect sensitive data, include an improved image scanner, additional predefined content detectors, and adjustable content detection thresholds, Google wrote in a Feb. 29 blog post. Each has been incorporated into the existing Gmail DLP service, which automatically checks all outgoing emails according to user-defined policies. With Optical Character Recognition, the app’s Gmail DLP feature can now analyze common image types including JPGs, PNGs, and GIFs, and extract text for user evaluation. The new predefined content detectors cover a wider range of personal information, such as credit card and bank account numbers, than before. 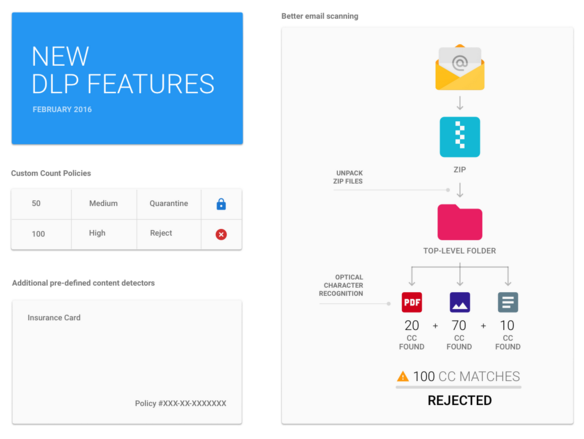 Google gives an overview of its new DLP features for Gmail in this graphic. And in response to Google Apps for Work customers demanding more fine-toothed control over DLP results, Google has introduced a count parameter, which allows customers to set up different DLP criteria based on whether a message contains individual or bulk personal information – for example, an email containing a single credit card number might be considered low risk, while one that contains 100 credit cards is high risk; and a confidence parameter, which allows users to adjust detection standards according to their needs. While Gmail DLP is only available to Google Apps for Work Unlimited customers at the moment, Google said it plans to add DLP features to Google Drive later this year. Meanwhile, users can find more information regarding the Google Apps for Work version of the program here.